It's the BEAD SOUP BLOG PARTY!! 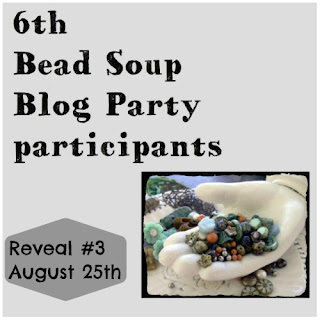 Let me start with a BIG Thank You to Lori Anderson, our hostess, for another wonderful Bead Soup Blog Hop. I know she's put a lot of time and effort into this all while battling her own issues. She's such an angel. I've made it around through the other two reveals this go-round and I know it's been a success so far. Congrats Lori. It's been lovely and I applaud all your work. Now. . .I'm so excited you made it here! I know there's a ton of blogs to hop, so let's get to it shall we. My partner, Karen Mitchell of Over the Moon Designs, sent me a wonderful array. Here's a quick mosaic peek of what I created with it. More detailed pictures are below. And a reminder of what she sent. Necklace. Soup ingredients used: Blue Raku pendant, rosewood beads, and turquoise Picasso firepolished Czech beads all from Over the Rainbow. 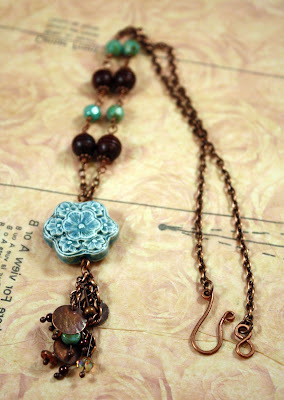 From my stash: copper chain, copper spacers, and other beads and charms. The clasp I made myself. Bangle Bracelet. Soup ingredients used: black cinnabar floral twist beads. From my stash: black annealed wire. I woke up having dreamed this design and had to make it happen. Wrap Bracelet. Soup ingredients: Copper chain from Spotlight and Greek ceramic spacers. From my stash: found seashells, mixed metal wire and jump rings, and copper lobster clasp. This is a long strand that wraps twice around the wrist. Brooches. Soup ingredients: Crochet flowers made by my partner at Over the Moon. From my stash: shank buttons and pin backs. Earrings. Soup Ingredients:Pink Rhodonite beads. 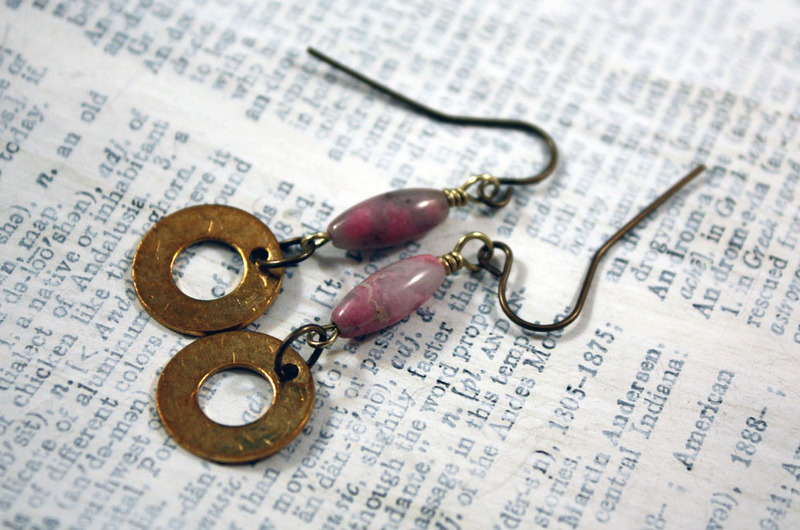 From my stash: antiqued brass earwires and jump rings, brass eye pins. I made the textured and patina-ed brass washers. Necklace: Soup Ingredients: Copper Swirl Clasp. From my stash: vintage mother of pearl buttons and copper chain. I made the antiqued copper jump rings and clasp. The toggle was altered by inserting a tiny button into the toggle loop and sealing it with ICE Resin. The toggle bar was wired above it. I still have the fiber, some chain, and a few beads leftover from the soup. I'm sure just as soon as this hop is over I'll have some more ideas. For now, I do hope you like what I created. Thank you Karen for a most plentiful serving. It was a total blast working with what you sent! I'm giving away the earrings I made. Just leave a comment and make sure your e-mail is attached somehow so I can contact you if you win. I'll draw a winner on Monday, September 10th. Good luck and thanks for stopping by. Below is the list of the other participants. Happy Hopping!! Wow, you made an entire collection. Those bracelets are great! I wouldn't dare pick a favorite. I too have dreamed up some jewelry designs. Mine aren't nearly as lovely though. Beautiful work. i love all your pieces!!! you did an amazing job, hope! The bracelet with the seashells is just wonderful!! I use reclaimed bits to use in my designs and I love that idea. Love what you have made! Love your vintage button necklace and I love that you re-purposed the toggle very cool. You did a lovely job with your whole soup Hope! What great pieces from such a wide array of things in your soup. I really like your seashell bracelet. I love seashells. And I like the way you sealed the little button in the toggle clasp and used it as a focal. Very nice. 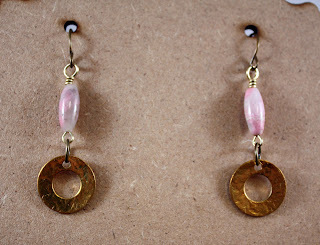 Your earrings in your giveaway are cute, too. Are fantastic pieces !How original, I like them !Congrats! Beautiful pieces I especially like the shell bracelet. Soup-er job! Great pieces. 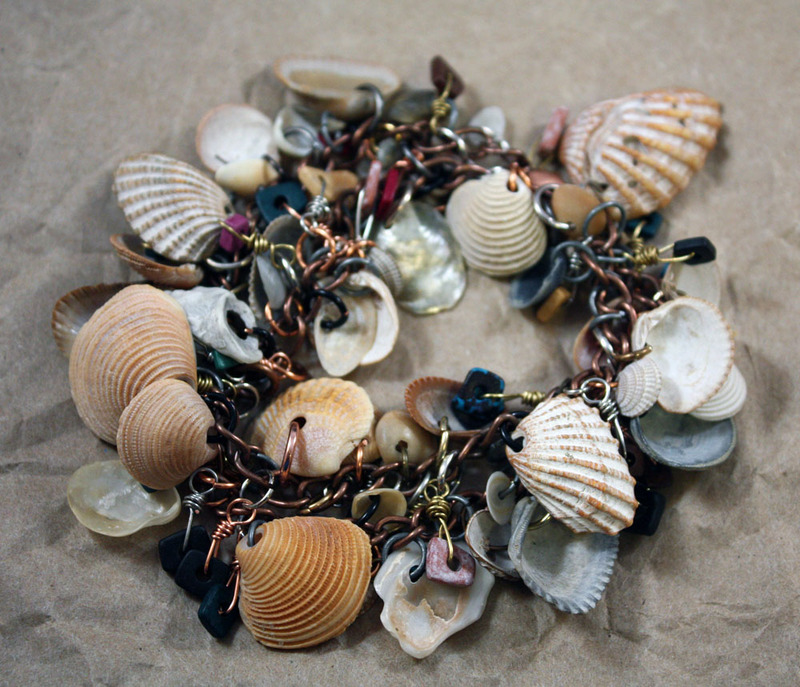 Love the bracelet with the shells. To everyone else so far, I think I've responded to you by e-mail. Here's my response for those of you without an e-mail connected to your comments. AntiquityTravelers- Thank you!! Yes, that bangle was such a stroke of sleepy inspiration. It looks so cool on. And buttons really are a weak point for me too. I had a lot of fun with that piece, but it definitely took me the longest to get just right. Penny- I appreciate your sweet words. I struggled with what to do with that toggle. It took me the longest to design that piece and since it was a required element, I knew I HAD to. When the lightbulb hit about using it as bezel, I ran with it at long last. I'm so pleased it turned out the way it did. Thanks! EWA- Thank you so much for you kind words. I appreciate you taking the time to come by and comment!! 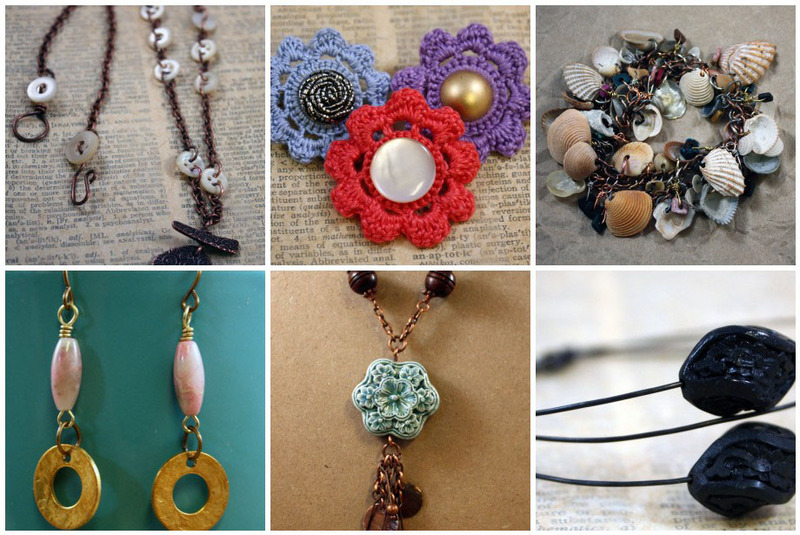 My favorite is the first necklace -- and then you know I love anything with buttons! You did a lovely job and you can tell you put time and thought into each and every piece. Love the necklace, beautifu Raku focal bead! The bangle bracelet is really artistic too! I absolutely love the bracelet with the seashell, adorable. Wonderful work. You did an awesome job with your bead soup! Lovely creations!! I love how you used those buttons in that last necklace...how creative! Great bunch of jewelry. The earrings are very cute. Did you find the seashells on the beach and drill them yourself? I really like the way they look on that bracelet. Great job on all your pieces. The blue Raku is my favorite. 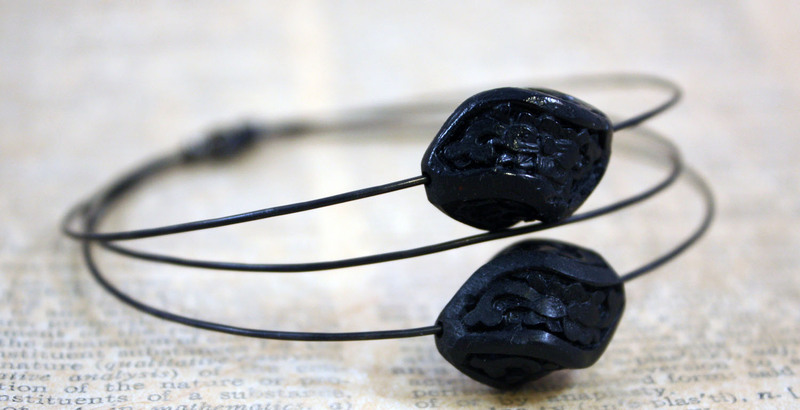 It was genius to set the button inside the clasp with resin & use it for a focal. Thanx for a chance to win your earrings. I have never seen such a gorgeous button necklace! And I would so wear those earrings. The necklace with the blue raku is super yummy! Well done! They all look amazing! Your collection is so unique and pretty!! I love the raku necklace and the copper swirl clasp/pendant is such a great idea!! Those crocheted flowers are delightful, and I love how you've altered pieces of your soup here and there - very creative use of your soup! Here's another mass response for those of you without e-mail attached to your profiles. Ahowin- Thank you! That bracelet seemed to just fall together one I gathered the shells. Cindy- I'm so glad you like them. It was fun making them, even if they do seem a little eclectic as a collection. I HAVE worn the bracelet and was totally distracted by the movement and just looking at the shells in that bracelet. It's a lot of fun. Thank you for hopping by! QHannah- Thank you so much. I do appreciate that!! Tanya- Yes, I struggled with coming up with something that would be a great accent for that toggle. When I decided upon the resin idea and found a button that fit, I knew I had my design. Thank you so much for your sweet words and for stopping in. Jo- I'm glad you like that necklace. It HAD to be made and went through at least one other version before arriving where it is. Thank YOU!! I am glad you made the bangle: it's amazingly beautiful! Love the button necklace too And the shell bracelet, oh my!! you are so good!! How many pieces you done!and all very inventive! congratulations! I love the bangle bracelet, would wear it every day. Great job with the soup. The necklace with buttons is very interesting! Love it! Bailaora- I started to do more, but made myself stop! :) I'm so happy you like what I made. Come back by anytime. Hello, Hope! I love what you created with your soup! You always do such a great job with your jewelry! I'm having fun hopping this time, but didn't participate. Can't wait to see what you do with what you said you had leftover. Have a great week! You did a beautiful job. Love the mother of pearl button necklace and that sea shell wrap is so cute. Great job! Where, oh where, do I start? Love the blue raku pendant and necklace that you created. Love the seashell wrap bracelet! So fun and summery, and I'm a sucker for dangles and cha cha! The button necklace is so creative. I love all of your designs. LeeLu- You make me blush! It makes me so happy that you like what I made. I had fun with the soup I got from Karen and I hope it shows in my designs. Thank you for your kind words and for taking the time to stop by! Great job on all the soup..really drawn to the bracelt with the shells...beautiful designs!! Rana- Thanks! I'm so glad you like that. I was worried that it would be too weird. I appreciate you stopping in! I love what you did with your bead soup the first necklace with the turquoise colored flower and dangles and the last necklace with the buttons, so cool that you put a button in the center of the toggle clasp and made it the focal, are my favorites. Oh and the shell bracelet that is my favorite. Um yeah the black bracelet with the cinnabar flower carved beads that is my favorite and last but not least the earrings are fabulous those are my favorite! Humm well that confirms it all of your pieces are my favorite. Very inventive use of your soup ingredients. Fantastic job! every piece is so different from each other...i love how unique your touches are! Marlene- Thank you so much. I had a lot of fun trying to think out of the box and out of my usual mindset. I'm glad you appreciate it as well. BeadsbyEarthTones- Thanks! I do try to stay unique as much as possible. Sometimes it works, sometimes it doesn't. I'm so pleased it seemed to work this time! Yay! wow! that great soup! i love how you changed that toggle into the centerpiece and added the button! i have a few of those toggles too and what you did with it was genius! they are such pretty toggles. WOW! You are very creative! I really love the copper and button necklace! I cant wait to make my own with a little "Angi" flavor! Thanks for the giveaway! I hope I win! Angi- Oh wow. . .thank you! That's one of the best compliments an artist could hear. I appreciate you taking the time to pop in and take a look at what I made! Very nice work and a very original use of some components! Hope, I knew you would make something fabulous, but you went beyond that. I love the shell bracelet, and that bangle you dreamed about, and the blue and copper necklace. Thanks for stopping by my blog and leaving such wonderfully positive comments! I hope we can keep in touch! love the necklace with the blue flower and the seashell bracelet!! great job, well done! Wow these bracelets are amazing! Zydie- Yay! I'm so happy you like the bracelets. Thank you so much! I love how you used the clasp, I never though of using Ice Resin with a clasp, very creative! I like all your designs, good job! Lori- I really struggled with what to do with that clasp because it seemed to chunky to just be on a delicate necklace like the first one. When I made my attempt to 'think outside the box' and came up with the resin idea, I was overjoyed! It pleases me so that you like what I came up with. Thank you! Love all of your designs! My faves are the first necklace and the charm shell bracelet! The bangle bracelet is too cool! Beautiful job Hope! I love the first necklace. Great collection of pieces there! I love the black bangle bracelets and the raku necklace too, but seriously, they're all fantastic! BeadRecipes- Aw, thank you! I really enjoyed coming up with ideas for this go-round of the party. Thanks so much for coming by and leaving such a sweet comment! Very cool work, Crafy Hope! Wow, all of your work is wonderful! Love the wrap bracelet with all the seashells!!! Love that first necklace! Good job! Very nice pieces - looks like you had a lot of fun. I love the way that where you live has influenced what you have made. Love the shell bracelet.